Players have to switch from cone to cone, they can only swap with the 2 players next to them. Player E has to try and get to the cone before the 2 players swap. If player E got to the cone before player A got there, A would go in the middle. Once the players have got the hang of it, you can add a points system in, where each player who swaps gets a point. 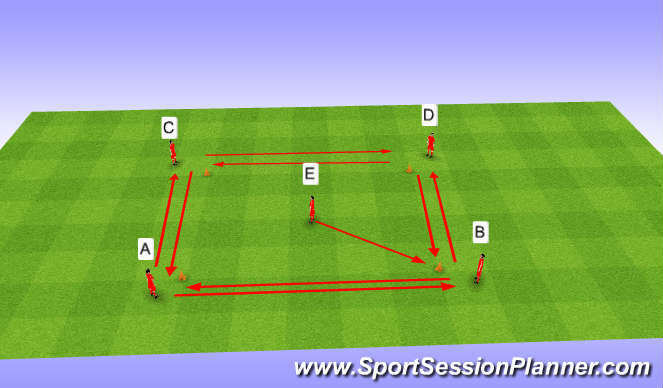 The game can then be progressed and each player on the outside has a football, they must then dribble from cone to cone. Once again the player in the middle must get to the cone before the players gets there. The ball is swapped if this is the case and players switch in the middle.